At just $2.25 each, the tacos at Hankook are one of the best deals in town. It’s nothing to look at, the location is out of the way and the décor is more blue plate special than Blue Ridge Grill. But the food? That and the amazing value are what make Hankook Taqueria one of the hottest new places in Atlanta. 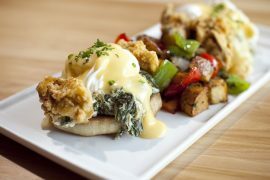 Located in Westside Atlanta, on Collier Road, Hankook is the creation of Tomas Lee, formerly with Buckhead Diner and Corner Cafe so he knows his way around the kitchen. The menu is blessedly short (for indecisive people like me) with your choice of five different types of Korean BBQ tacos: chicken, beef, pork, fish and tofu. They all come with lettuce, green onion, green cabbage tossed in soy sesame vinaigrette, yellow onion, cilantro and lime juice. You can get your tacos from the Yumbii food truck too. Follow it on Twitter to find its next location. At just $2.25 each you’ll be tempted to order several tacos, but I’ve found them so large that’s it’s pushing it for me to eat two. And you’ll want to save room for a few tastes of the Street Snacks, like the fried dumplings, tempura fried Korean sweet potatoes or sesame fries. Hankook also serves burritos and quesadillas and features a few specials each day. No alcohol is available but you can take your own with you. 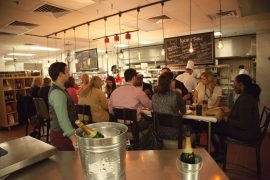 You order at the counter from some very friendly ladies and take a seat wherever you like on the diner-style tables covered with kitchen-motif tablecloths that may look familiar to any “I Love Lucy” fans. Once open only for lunch, Hankook is now open until 9 Tuesday through Saturday nights so it’s perfect for a quick bite before heading out on the town or just heading home. 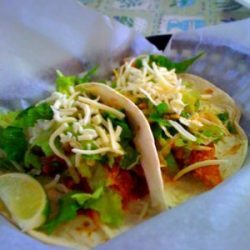 And if you notice a large orange-and-blue food truck with Yumbii on the side, follow it and get your Hankook tacos there as well. Tomas has partnered with Carson Young, who runs the truck. 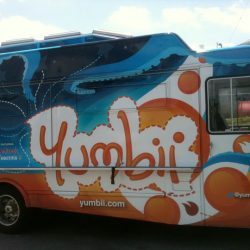 Check on its next location by checking out the website or following it on Twitter at @yumbii. However you do it, get yours hands on the some Hankook.